Solid Sand Dollar Survival: Enter the Weight Belt!! We looked at Sand Dollars (highly specialized sea urchins in the order Clypeasteroida) with lunules (i.e., the holes or notches in their body) and how those lunules were used as mechanisms to prevent sand dollars from being picked up and washed/"blown" away by the water currents around them. But if you don't have lunules, then how do you cope? Answer: Get a WEIGHT BELT! Juvenile sand dollars (Dendraster excentricus) selectively ingest heavy sand grains from the substrate and store them in an intestinal diverticulum which may function as a weight belt, assisting the young animal to remain in the shifting sandy environment. The sand disappears from the diverticulum when the animal reaches the length of 30 millimeters. That's pretty much as simply amazing as it sounds (Plus, how often do sand dollar papers make it into Science?). Several of these "un-lunuled" sand dollars apparently have a very specialized intestine which has a bunch of tubes and pouches in the peripheral part of the animal's body. In, at least some species, this part of the intestine is filled with selectively heavier sand grains! 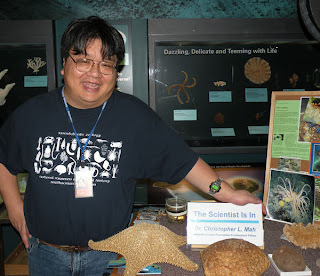 Chia found that in Dendraster excentricus, a cold-temperate water sand dollar from the west coast of North America (California, Washington, Canada, etc. 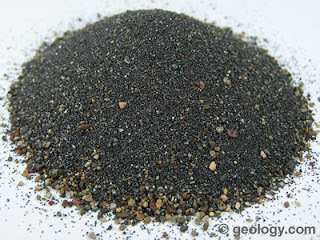 ), that there was a high percentage (78%) of high-density magnetite sand grains in these intestinal "weight belts" versus a presence of only 9.8% of the surrounding sand!! However, Chia's study focused on juveniles and it wasn't clear what the ramifications were for OTHER sand dollars or for that matter for adult Dendraster! 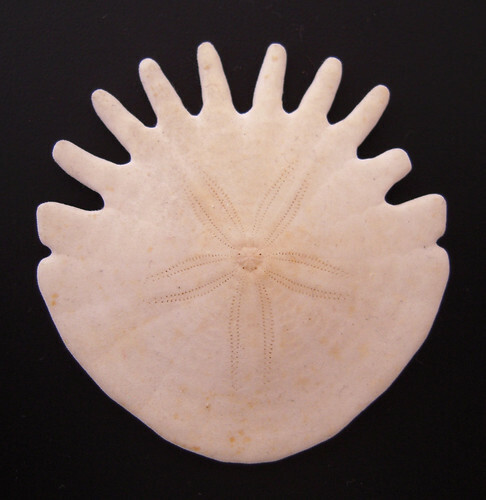 Weight Belts & the Evolution of Sand Dollars! 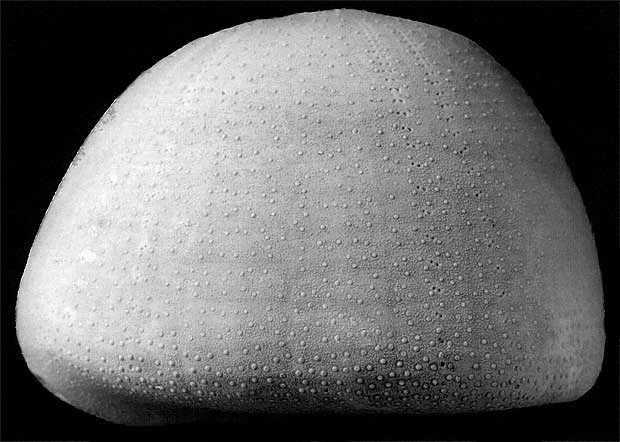 In 1996, a neat paper by Rich Mooi and Chang-Po Chen was published in the Bulletin of Marine Science which surveyed weight belts across the many different types of sand dollars. How many sand dollar taxa have a "weight belt"? Was having a weight belt more of an incidental evolutionary response? 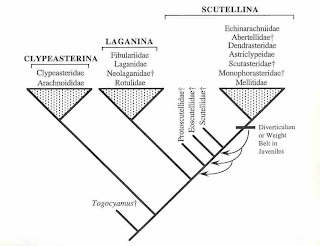 Or were these actually a broad phylogenetic character event? or Something that evolved across a whole GROUP of sand dollars? 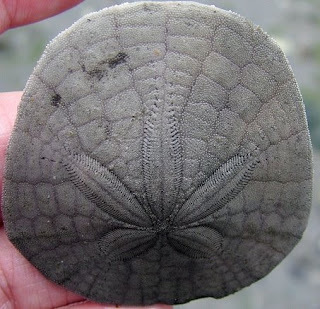 Also, as it turns out, weight belts are a unique feature (i.e., a synapomorphy) of a major clade (i.e., evolutionary group) of sand dollars called the Scutellina, which includes not only 'un-lunuled" but also the "lunuled" sand dollars. but expression of weight belts IS an important factor in different species. For example, in Dendraster , the shallow-water species, D. excentricus, which lives in high-energy environments retains its weight belt at GREATER sizes then does D. laevis, a deeper-water form that would presumably not be as vulnerable to high-energy currents. 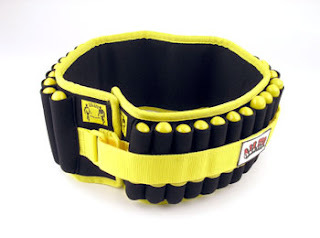 weight belts that keep the body forms stabilized and "weighted" down on the sandy bottom. So, in this time of financial crisis! We may all continue to look toward Sand Dollars as a good way to keep our economic markets well-anchored and safe from being blown away!! More Sand Dollar Stuff tomorrowish!! What are those Holes in Sand Dollars for? The Airplane-Sand Dollar Connection! What are those holes in Sand Dollars for??? So..probably everyone has SEEN sand dollars or knows what a sand dollar is... (just fyi..they are highly modified sea urchins!). 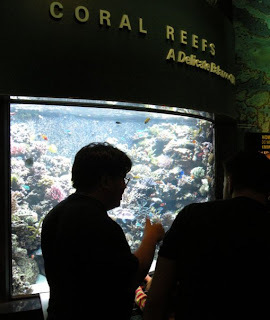 Most live in shallow tropical to temperate water environments all around the world. They largely live in unconsolidated sediment on organic detritus and when they die, their bodies (also called a "test") frequently wash up on beaches and such.. 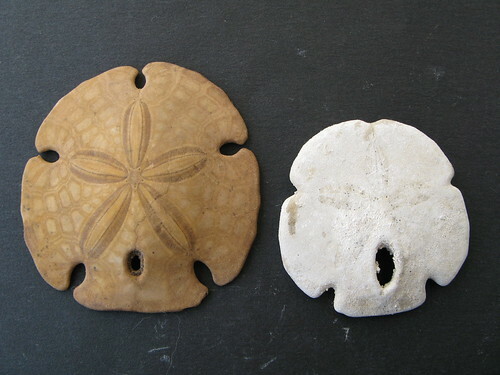 These are familiar to the tropical beach-goer and names such as "keyhole sand dollar" or "keyhole urchins". One of the most obvious features are the presence of BIG holes or prominent notches on the sides of the test (aka the body). These are called lunules. The data and results for this are taken from a neat paper by Malcolm Telford (1981-Hydrodynamic Interpretation of Sand Dollar Morphology. Bull. Mar. Sci .31(3):605-622) who takes a biophysics/ hydrodynamic interpretation. Our understanding starts with this basic tutorial on (oddly enough) how airplanes fly. While watching this, replace "airplane wing" with "sand dollar"
Okay...So, what's going on here? Sand dollars, such as Echinarachnius, tested with wind tunnels and dye+water flow simulators where lunules were ABSENT showed a relatively high coefficient of lift! What that means is that the same pressure differential that makes airplanes fly is accomplished more easily where lunules are absent. 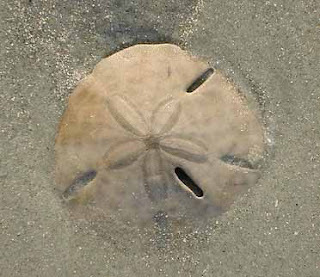 Essentially the hydrodynamic flow moves over the discoid form of a sand dollar like Echinarachnius smoothly and easily. But what happens with a "keyhole" sand dollar such as Encope or Mellita?? 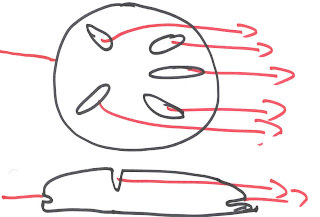 Lunules REDUCE lift either by interfering with hydrodynamic flow or by "relieving" pressure from the under surface!! i.e., they INTERRUPT and LOWER the coefficient of lift! To put this simply..they KEEP THE SAND DOLLAR FROM BEING "BLOWN" away!! The lunules of Mellita reduce lift by providing channels to bleed off excess pressure from the oral surface. This is shown by the clear flow of water (which was marked with dye)...through the lunules. 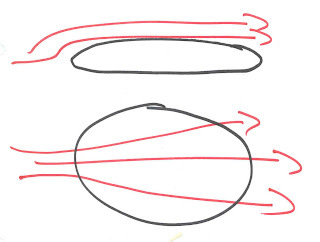 Telford used three different sea urchin tests as models, and each one had its own specific modifications and stories..
For example, the edges of the body and around the lunules of this Encope for example are actually modified into pressure drainage channels (i.e., places where lift is further weakened)! 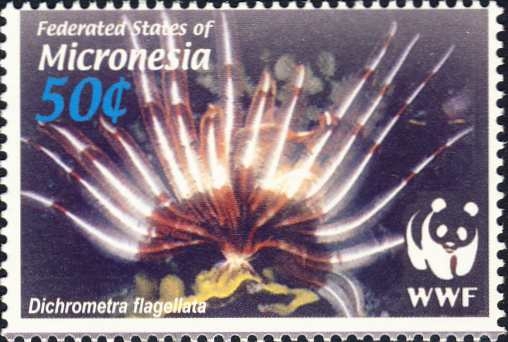 Subtle modifications, such as the absence of tube feet in these areas are also present. After seeing how lunules and notches can affect and help these animals from attaining "lift-off" one has to wonder then, what happens with critters like these rotulid sand dollars with the odd notches and lunules below?? One of these days I hope we find out! But how do the urchins WITHOUT lunules solve this problem?? Go here to see all about sand dollar weight belts! Pencil Urchins Crucial to Hawaiian Literacy?? Neat! Go check it out!! Thanks to David Williams for bringing this blog to my attention! 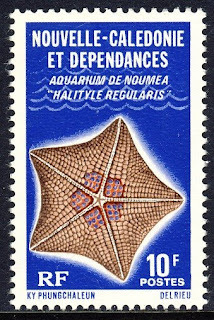 Starfish & Stamps of the Spiny Skinned!! aka What have you done for me philately? 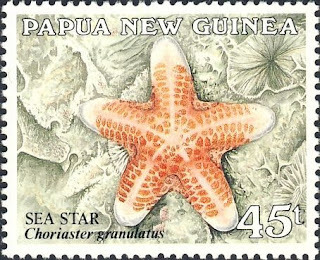 So, today I thought I would just treat everyone to some really cool images I found of various countries that have made really UNCOMMON starfish species into POSTAGE stamps!! How cool is that??? 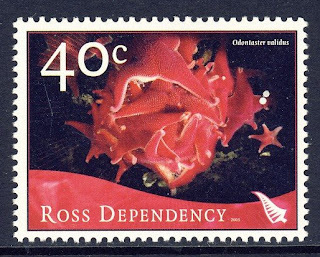 A nice gallery of these starfish stamps is found here at the WoRMS image gallery. 3. 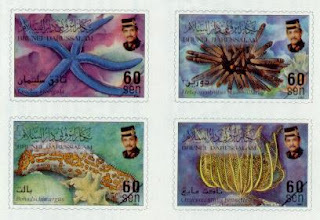 A nice assemblage of tropical echinoderm stamps are published by the Sultanate of Brunei (thanks to Joyce for clarification)! A nice little write up on these stamps is here. 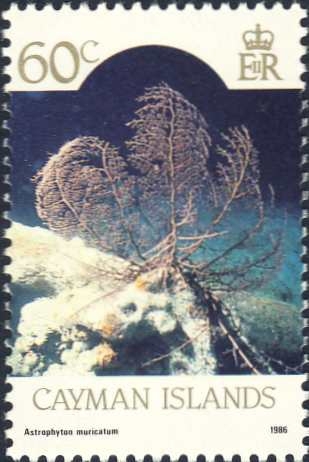 A more detailed treatment of these stamps can be found here. 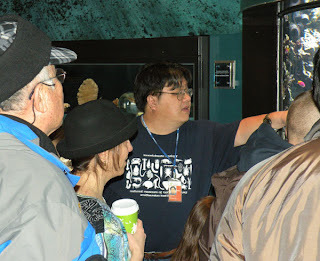 7. and even Crinoids & Ophiuroids!! Another post on Friday and then I'll be BACK in full next week! 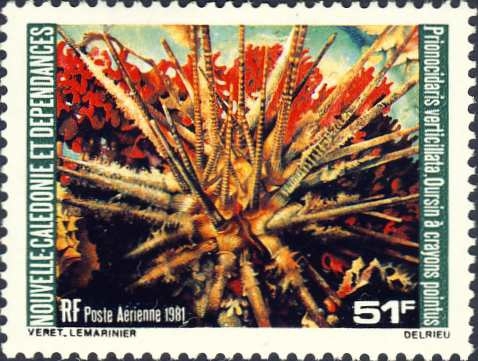 Archaeological Echinoderm Pt. 2! Sea Eggs and St. Boniface's Pennies! So..whilst writing up the account earlier this week (go here to see pt. 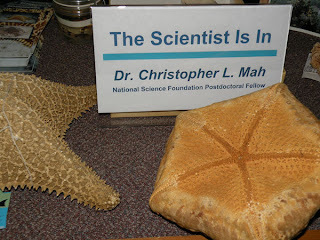 1 about urchins in folklore), I hit a treasure trove of information on the role of fossil echinoderms in historical folklore! Here's a few more interesting bits about echinoid fossils from Northern Europe! 1. Sea or Snake Eggs. 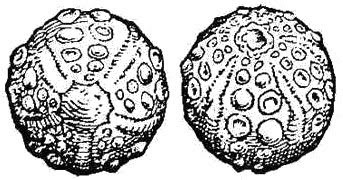 Many sea urchin fossils (these look somewhat like cidaroid urchin tests) were believed to have magical healing powers or other supernatural properties. According to an ancient Celtic tradition innumerable snakes twining together at mid-summer make a ball out of froth which they exude. It was called the ovum anguinum. 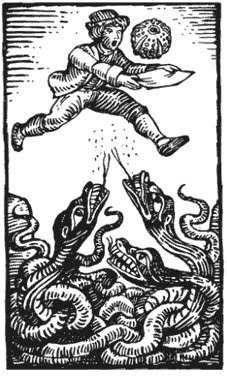 If it could be stolen from the snakes it was an object of great magical power. 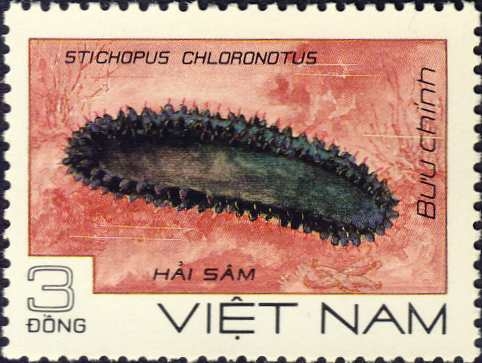 It was said to be covered with a crust having excrescences like the suckers of a cuttle-fish. It possession ensured success in battle and disputes. Further info on the whole snake angle can be found on this French website and the British Museum has a solid summary here. "subduing acrid humours of the stomach"
sea-sickness remedies SO effective that some seamen would not travel WITHOUT having a "chalk egg" handy. 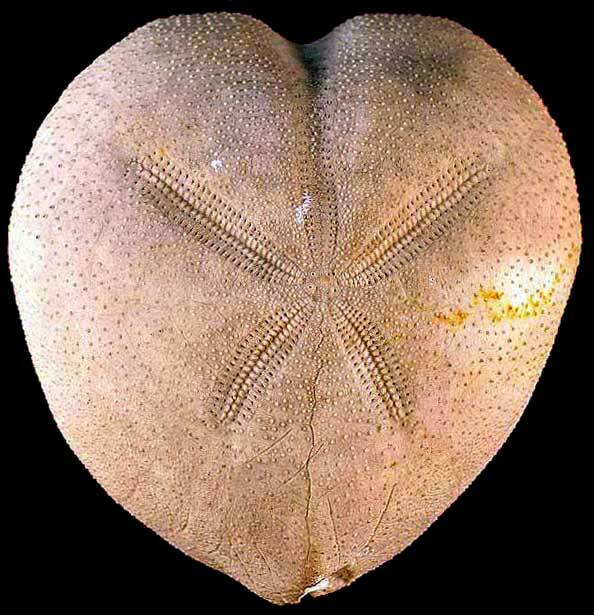 It is of the greatest interest in this connection that some similar religious superstition with regard to fossil sea-urchins appears to exist in recnet days in India. Dr. Eigil Nielsen informs me that at a party in New Delhi a lady told him that in some places in India people place fossil sea-urchins on house-altars, adorn them with flowers, which must be put on fresh every day-otherwise some misfortune will happen. I have till now not succeeded in getting exact information about this matter. 2. The oh-so delicately named "Jewstone"
(images from the BMNH echinodea database). Their shape was strongly suggestive that they would serve as treatment for bladder-related medical problems in accordance with "established magic principles"!! 3. Crinoids columnals aka St. Boniface's Pennies! 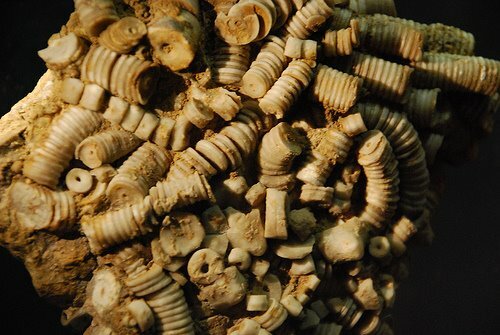 And of course, what kind of fossil record would we have without crinoid columnals? These were commonly used in the Bronze Age as beads. In Germany, these were known as Bonifacius Pfennige or St. Boniface's pennies and were used as "fairy money" (whatever that happens to be). And in the North of England, they have been known since the 17th Century as St. Cuthbert's beads as indicated in this passage from Scott's Marmion (as recounted by Oakley, 1965). Archaeological Echinoderm! Fairy Loaves & Thunderstones! 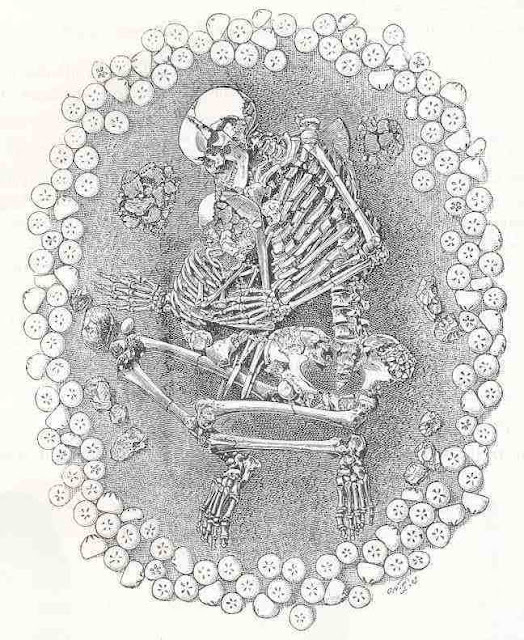 Skeleton of woman and child, surrounded by a wreath of sea-urchins, apparently Micrasters, found in a tumulus at Dunstable Downs, N. of London. From Worthington G. Smith. Man, the Primeval Savage, 1894. So yes, what you are seeing is a ceremonial grave arrangement surrounded by fossil sea urchins! The sea urchin in question is Micraster, a fossil "irregular" sea urchin which occurs from the Upper Cretaceous to the Early Tertiary in Northern Europe and Africa. Fossil sea urchins and other echinoderms occur widely throughout Northern Europe and were apparently used quite frequently in several Mesolithic to Early Bronze Age human communities. Fossil irregular sea urchins had several common names (for several different fossil taxa) and found their way into several ceremonial uses. Two are pretty well documented from Northern Europe. 1. "Thunderstones." Based on one account, it was believed that the "thunderstones" (i.e., Micraster and others...) had arrived in a thunderstorm and that it served as protection because 'where it had once struck it was not worth coming again'. Extended notions of thunderstones believed that these followed ONLY after a "crashing thunderclap" and that the stone's landing created the noise!! Others thought that thunderstones 'sweated' when it was certain that a storm was arriving. Thunderstones were also made into axes and kept on pantry shelves because they "kept milk fresh and caused plenty of cream". 2. 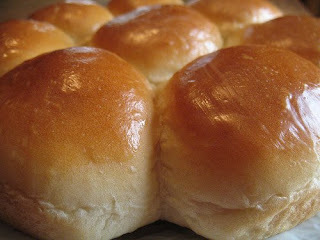 "Fairy Loaves". 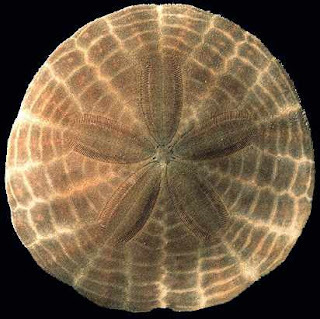 Differently shaped urchins had different names..
For example, some such as the oblong irregular urchin Echinocorys were called "Fairy Loaves"
probably due to their resemblance to loaves of bread.. The resemblance between these echinoids and round loaves inspired people in north-east Suffolk to place them as charms by the hearth in the hope that the baking bread would be influenced by the fossil's loaf-like shape. It is said that families who kept fairy loaves in their houses could ensure they would always have bread. Failure of the weekly bread to be properly formed was attributed to witchcraft against which Fairy Loaves had protective powers. The powers given to these fossils underlines just how vital bread and breadmaking were to daily life and village economy in Suffolk during times gone past. The fairy loaf in Suffolk was also called pharisee-loaf which at some point became facy-loaf. Farcy is a disease in horses and it has been suggested that the fossils were also used as charms by farm horsemen . Go here to see pt. 2 of this topic! A look at one of the world's rarest starfish! The specimen is a member of the MYXASTERIDAE, a group of truly deep-sea (1000-3000 m) starfishes, which is one of, if not, the rarest group of starfishes in the world. Nine species in three genera are found in the Atlantic, Indian and the Pacific Oceans. What makes any animal rare?? A combination of abundance as well as frequency of occurrence. 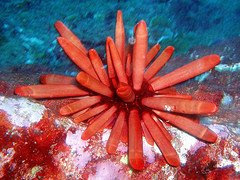 When most people think of the rarest deep sea echinoderm/star shaped thing, many automatically think of the so-called "sea daisy" Xyloplax which I have covered here and here. What makes myxasterid starfish MORE rare then Xyloplax? While its true that Xyloplax has only been encountered once or twice every 15 years..there are actually about 100 specimens of each species known. How many myxasterids are known? But of course, there is ALWAYS more to the mystique of rare animals then their rarity. What evolutionary novelty makes myxasterids so interesting?? and the PTERASTERIDAE or the Slime or Cushion Stars. 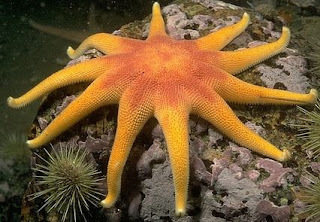 So, you have a starfish with multiple long-arms IN ADDITION to structures that ostensibly enable it to project the huge amounts of mucus that pterasterid starfish produce? Do I have a new species? Are they related to the starfish species everyone thinks? Are they ACTUALLY really rare?? A great way to kick off the New Year! Happy 2009!! Time Lapses...and so, Time for Time Lapse!! Starfish1 from Raul Alvarez on Vimeo. Starfish2 from Raul Alvarez on Vimeo. And..this has NOTHING at ALL to do with echinoderms..but it is AWESOME!